The term “Amish Furniture” brings to mind fine craftsmanship and heirloom quality, but not all Amish furniture is the same. At Herron’s, we have been forging relationships with our Amish builders for more than 20 years- choosing only the cream of the crop, the best of the best, to sell to our customers. The 86 Mission 5 Slat Chair is just one of our many Amish built dining room chairs to choose from. Choose your favorite wood and select from a wide variety of durable finishes to make it uniquely yours. Some have the option of fabric seating. Also some chairs can be made into a rocker, barstool, desk chair, or arm chair. Perfect for building generations of memories around the dinner table! The term “Amish Furniture” brings to mind fine craftsmanship and heirloom quality, but not all Amish furniture is the same. At Herron’s, we have been forging relationships with our Amish builders for more than 20 years- choosing only the cream of the crop, the best of the best, to sell to our customers. The Carolina Chair is just one of our many Amish built dining room chairs to choose from. Choose your favorite wood and select from a wide variety of durable finishes to make it uniquely yours. Some have the option of fabric seating. 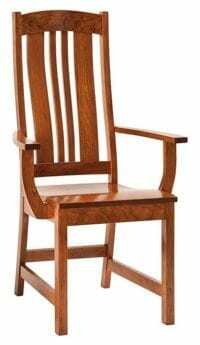 Also some chairs can be made into a rocker, barstool, desk chair, or arm chair. Perfect for building generations of memories around the dinner table! The term “Amish Furniture” brings to mind fine craftsmanship and heirloom quality, but not all Amish furniture is the same. At Herron’s, we have been forging relationships with our Amish builders for more than 20 years- choosing only the cream of the crop, the best of the best, to sell to our customers. The White River Chair is just one of our many Amish built dining room chairs to choose from. Choose your favorite wood and select from a wide variety of durable finishes to make it uniquely yours. Some have the option of fabric seating. Also some chairs can be made into a rocker, barstool, desk chair, or arm chair. Perfect for building generations of memories around the dinner table!